EcoLogic conducts qualitative and quantitative evaluations of the biota and habitats of specific study areas, often in the context of defining priority areas for protection or restoration. Our staff scientists have the field expertise and training to complete detailed surveys of aquatic, wetland, and upland habitats. We specialize in surveys of aquatic macroinvertebrates to assess stream water quality, threatened and endangered freshwater mussels, stream fish communities, and aquatic macrophytes. We collect data with a consideration for annual changes in hydrology and life stages of organisms, consult state and regional databases, and compile and review reports of other investigations. Data produced from surveys is used to characterize baseline conditions, evaluate the degree of environmental perturbation, assess impacts of invasive species, define priority areas within subwatersheds, examine habitat quality over time, and compare biodiversity among sites. Aquatic habitat characterization and assessment methods are customized to meet the client’s needs and site-specific conditions, but typically include determination of substrate characteristics, composition of macrophyte communities, cover types and abundance, water depth, current velocity, and water quality (e.g., dissolved oxygen levels, pH, conductivity, temperature). 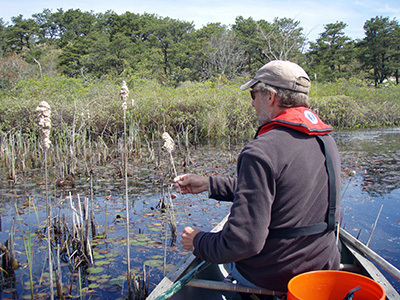 Macrophyte sampling may be qualitative (e.g., species presence) or quantitative (e.g., rake toss survey, quadrat sampling). Aquatic macroinvertebrate community evaluations are also custom-designed, but typically follow the appropriate state-specific protocols for biological assessment of water quality or biotic integrity. EcoLogic’s macroinvertebrate specialist, Kurt Jirka, has over 30 years of experience in sampling and identification of aquatic macroinvertebrates from streams, rivers, lakes, and wetlands and application of rapid biological assessment protocols. EcoLogic also has the capability to conduct fish community surveys involving the use of backpack electrofishing, seines, trap nets, and gill nets.